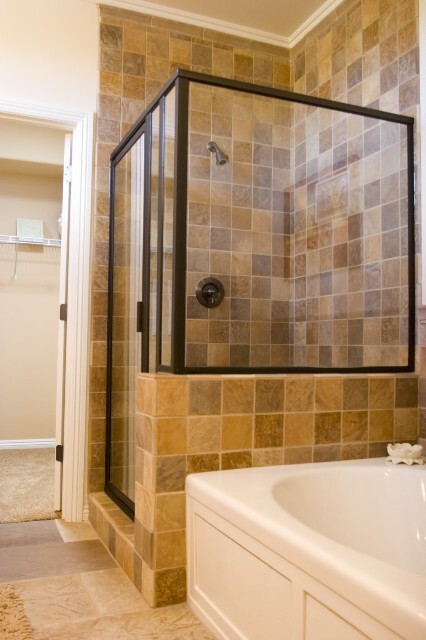 Bathroom shower upgrades are a great way to increase the resale value of your home. If you have a larger bathroom, you may want to consider adding a walk in shower or even a steam shower for a high end look and feel. Separate walk-in showers are convenient, and usually found in many modern contemporary homes. These showers can be created with a variety of different materials depending on your personal preferences and budget. On the lower end of the spectrum, you can purchase prefabricated showers, with a plastic surround. These can be roughed into to your bathroom as long as you have the space, and the copper water supply lines already in place. These are not elegant, however for people who want something plain and functional this is a good option. You can purchase these units from places such as Lowe’s or Home Depot. If you are looking for a more elegant solution, a tiled walk-in shower is a great way to enhance the look and feel of your bathroom. The cost of tile differs dramatically based on what type of tile you are looking to purchase. High-end commercial style Caesar Ceramic tiles will cost $25 per square foot, however they are extremely elegant. Laying your own shower tile walls is a very easy and straightforward project. The most difficulty you will have is cutting the tiles (commercial tiles are thicker and heavier). If you have never installed your own tiles for walk-in showers you can find tutorials on YouTube with step by step instructions. If you have a smaller bathroom you may want to use lighter color tiles, and pair this with a 100% clear color glass door. Clear shower doors give the illusion of larger space, compared to opaque or frosted glass shower doors. Instead of hiring a professional designer, you can get your own ideas by looking through magazines which feature fully finished bathrooms. If you are trying to create a zen-like serene steam shower, you may want to try looking through Dwell magazine. Dwell is a home magazine, which targets people who are interested in modern and minimalist designs. You can purchase tiles at Lowe’s or Home Depot, however this can be overwhelming if you don’t already have an idea design concept. Visit your local specialty tile stores if you want the greatest selection. Many of these stores also have full mock up bathrooms with showers, so that you can see exactly what the complete product will look like. The best way to design and install the shower floor is by using a preformed plastic single piece unit. Although you can also tile your actual physical floor of the walk-in shower, this is not recommended. It takes a good amount of skill and patience to properly build the underlying surface, with a proper angle level for draining. If you do not properly grout and seal the bottom corner tiles, you can also risk water leaks. Using a preformed plastic floor pain can save you a lot of headaches in the long run. If you are replacing an existing bathtub, you can find a plastic floor with the same exact dimensions/footprint. You can also minimize the amount of plumbing work you need to perform, as the drain hole is in the same exact location as your prior drain.